Blog Is Jesus Our Hope Or A Means To It? 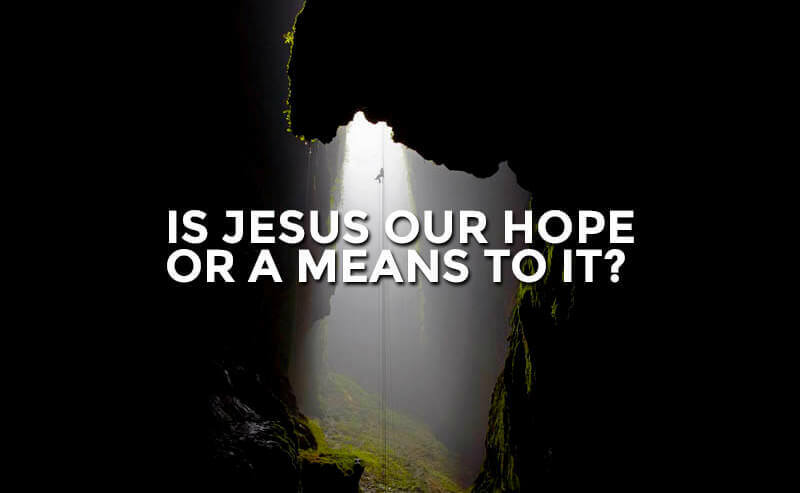 Is Jesus Our Hope Or A Means To It? Hope – I really like that word. Even just saying the word makes me feel like I have a more positive expectation for what the future will hold. It’s interesting the different things people put their hope in. Some put their hope in money. Some in a relationship that they are expecting will give their life meaning. Some put their hope in the affirmation and recognition of those around them. We all have things that we are expecting to make us fulfilled. Most of the time these are things that aren’t bad in and of themselves. As followers of Christ, we have a different hope than the rest of the world. Our hope is in Jesus. We rejoice, like Paul writes towards the end of Romans 7, that through Jesus our salvation will be complete and He will save us from our sin and this body of death. The problem is that we are prone to wander. We tend to put our hope in things other than Jesus. This often happens over an extended period of time. We don’t notice that our affections and expectations have shifted to something other than Jesus. This “hope in things other than Jesus” (let’s call it what it is: idolatry) can be sneaky. I read a quote that basically said this, “The biggest obstacle in our lives is what we imagine our life is going to be like.” The first time I read that I immediately realized that I had a problem. What if life doesn’t turn out the way I want it to? What if my life doesn’t even turn out decently well? So many things could happen to me. A near fatal accident to me or someone I love that changes the course of my life forever. Or even a fatal accident, for that matter! What if I don’t live the long life that I imagine I will? What if I never get the recognition that I want from others? I know these are things that you can’t think about all the time, but that quote made me realize that my hope wasn’t actually in Jesus. My hope was in what I imagined Jesus was going to do for me. There were things that I thought were best for me and I expected Jesus to do them instead of trusting that He knew what was better for me. Sometimes, I forget that He sees all of the present and all of the future, while I see only a very limited view of the present and cannot accurately interpret the past. Hope in Jesus is this – no matter what happens, He is enough in every situation. He is all-powerful and good. Not “good” because He is going to do what I imagine will make me happy, but “good” because He sees everything and knows how it’s going to play out. He loves me and whatever happens to me has to first pass through that love. He will work out the painful things that happen in life for our good (Romans 8:28). Our hope was never meant to be placed in how this earthly life turns out, but in our eventual complete salvation in Jesus (1 Corinthians 15:19). Can we praise God in painful seasons of life, like Paul and Job? Because that is real trust. That’s when you know that all your hope is in Jesus. This isn’t easy. It takes God’s grace to be able to trust Him, but there is freedom in it. Whatever we choose to put our hope in is what we are looking for to make this life worth living. And when it’s in Jesus, we can be content in every situation like Paul. Paul’s life was difficult to say the least, but in that difficulty he experienced freedom beyond what most people experience. Paul rejoiced in everything. Put him in jail and he’s worshiping. Beat him and he thanks Jesus for the opportunity to suffer. His life was built on the Rock. Everything, except for Jesus, can be taken away. And if our hope is in anything besides Jesus, it’s like building our house on the sand (Matthew 7:24-27); it’s dangerous and it’s sin. So what do you have your hope placed in? Is there anything that if you didn’t have it would make life not worth living? Is your hope placed in Jesus or are you hoping that through Jesus you will get the things you are really hoping for? Let’s repent of our idols and choose to put all our hope in Jesus.